When people ask, ‘How do you treat heel pain?’ we like to talk about one of our most effective therapies, Low Level Laser Therapy (LLLT). Though lasers sound like something out of a vintage science fiction novel, lasers have been an evolving part of real medical therapies. Scientists developed the first lasers in 1951, but there were very few non-research applications for the technology. In 1962, the first laser was used in heart surgery to remove plaque from the inside of the veins. Medical lasers have come a long way. The Foot Clinic uses the Thor LLLT for the treatment of all musculotendonous and nerve complaints. The reason this type of laser is referred to as a cold laser is because it does not burn the skin. 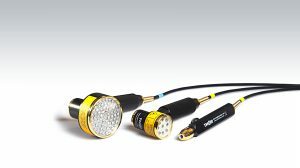 The class 3B laser device produces 790nm-800nm wavelength infrared light. The therapeutic wavelengths are invisible to our eyes, as the human eyes can’t see red wavelengths beyond about 700nm. For this reason, the THOR Laser also produces 660nm visible red light to allow the practitioner to see where the tissue is being treated. A group of diodes beam the infrared light into the layers of the skin, the cells, and the fluids suspended in the cells. This is ideal for deep musculoskeletal disorders, especially for stimulating the tissues and fluids around tendons, bones, and joints. The concentrated laser light produces an analgesic effect and starts the healing of tissues by reducing the inflammation. The light penetrates cell walls and stimulates enzymes (cytochrome c oxidase) to enhance the cellular energy cycle and cellular respiration. The cells increase the production of adenosine triphosphate (ATP) and release oxygen and nitrogen. The science doesn’t stop with waking up cellular activity. The LLLT increases both cellular respiration and vasodilation (opening of the blood vessels). The increased activity releases and removes the free radicals from the cells and fluids between the cells. As the free radicals are transported out of the cell, the cellular stress response lessens. As the inflammation goes down, the recovery improves. The THOR Low Level Laser Therapy has the best results when used to treat heel pain early. The combination of decreased inflammation and increased cellular activity can stimulate faster healing and speed up the rehabilitation. Visit a podiatrist at the first sign of pain, because quick treatment can prevent further damage to the tendon, ligament or injury caused by compensating for the pain. Want to know more about our Thor Laser Therapy Treatment? Or any of our other treatments available.